Inca Trail to Machu Picchu. Part of the 23,000 kilometers (approximately 14,000 miles) of roads built by the Incas in South America, this is Peru’s most famous trekking route and possibly one of the most spectacular in the Americas. Every year; some 25,000 hikers from around the world walk along the extraordinary 43 kilometers of this stone-paved road built by the Incas leading to the unassailable citadel of Machu Picchu located in the depth of the Cusco jungle. The Inca Trail to Machu Picchu starts in the village of Piscacuho, at kilometer 82 of the Cusco – Quillabamba railway and takes three or four days of strenuous walking. The route includes an impressive variety of altitudes, climates and ecosystems that range from the high Andean plain to the cloud forest. Travelers will cross two high altitude passes (the highest being Warmiwañuska at 4,200 m.a.s.l.) to culminate the hike with a magical entrance to Machu Picchu through the Inti Punko or Gateway of the Sun. One of the main attractions along the route is the web of ancient settlements built in granite rock by the Incas like Wiñay Wayna and Phuyupatamarca immersed in an overpowering natural scenery. Hundreds of species of orchids, multicolored birds and dreamlike landscapes provide the ideal backstage for a route that every hiker should walk at least once. Trek with us on the famous Inca Trail to Machu Picchu. See for yourself why this is the most popular hiking trail in the Andes! Spellbinding mountain scenery, unforgettable Inca sites, and a cornucopia of flowers and hummingbirds await you. Our five-day program allows the traveler time to explore and enjoy the amazing archaeological sites, landscapes and nature along the way. While most other programs force trekkers to speed through the stunning high-altitude Inca Trail, we take the time to enjoy this once-in-a-lifetime experience. We camp the first three nights, enjoying great meals and sturdy tents. The hikes average six to seven hours each day, including time to explore the Inca sites we pass through and to take in the unparalleled scenery. On the fourth afternoon we arrive at Machu Picchu after the crowds have left, and have time to explore the tranquil ruins. After a well-deserved night at a comfortable hotel, we return to Machu Picchu to see the ruins in perfect morning light. In the afternoon we return to Cusco by train. This program is specially designed to offer a more relaxed trek and a deeper understanding of Inca culture. Day 1: Cusco to Llactapata: We depart Cusco at 8:00am in a private transport, which will drive us to km.82, the starting point of the Inca Trail. We start our hike walking along the left shore of the Urubamba river. Following the trail along a flat terrain, we arrive in Miskay (2800m/9184ft), to then ascend and finally see, from the tallest part of an overlook, the Inca city of Llactapata (2750m/9020ft). From this point, we descend to the ruins, next to which we set our camp, after an approximated 3 hour walk. We spend the afternoon exploring and visiting this archaeological site. Day 2: Llactapata to Llulluchapampa: We wake up early to continue trekking along the valley created by the Kusichaca river, gradually climbing until we reach the farming community of Wayllabamba (3000m/9840ft). All along the way we see spectacular views of the Vilcanota mountain range on the opposite side of the Urubamba River, where the impressive Veronica peak reigns at 5832 meters above sea level. Not to mention the diversity of wild flora and fauna that can be found all along the valley. Continuing through the trail, we leave Wayllabamba behind to begin the most difficult part of the trek, which consists of an abrupt and steep ascent that stretches for 9 km and reaches the first mountain pass in the Inca Trail, the Abra Warmihuañusca (Dead Woman’s pass). We only climb half way up the pass, stopping at Llulluchapampa, where we camp and spend the night. Along the climb, the landscape changes from sierra to puna (a dry and high area with little vegetation), having the chance to spot domesticated llamas and alpacas grazing on ichu, one of the few plants that grow at that altitude. We also cross an area of the so called cloud forest, which is the habitat for many different kinds of birds like hummingbirds and sparrows and the Andean bear, which is also called the Spectacled Bear (Tremarctus Ornatus). We advise that on this day and the next one specially, your day pack is well stocked with candies, chocolates and coca leaves that will keep your sugar level high, and help with altitude sickness. Day 3: Llulluchapampa to Phuyupatamarca: After breakfast, we continue our hike up the highest point in the Inca Trail, reaching the mountain pass of Abra Warmihuañusca (Dead Woman’s Pass – 4200m/13776ft) after about 2 hours. Immediately after the pass, we descend into the Pacaymayo valley (3600m/11808ft), from which we then start to climb to the second pass, the Abra Runkurakay (3970m/13022ft). Half way up, we visit the archaeological complex with the same name. This site, located at 3800m/12464ft, consists of a small oval structure that is believed to have served the purpose of a watchtower. After going over the pass, we descend towards Yanacocha (Black Lagoon) and enter the cloud forest to finally arrive at Sayacmarca (3624m/11887ft). This is a beautiful complex made up of a semicircular construction, enclosures at different levels, narrow streets, liturgical fountains, patios and irrigation canals. Continuing up an easy climb, we arrive at the third pass, the Abra Phuyupatamarca (3700m/12136ft). Along this climb we can appreciate the magnitude of the Incas´ ancient craft, by walking along paths semi-detached from the mountain, and seeing rocks that fill up ravines in perfect order, saving the trail from the multileveled Andean geography. We go through an Inca tunnel to later arrive at the aforementioned pass and down to the complex of the same name. This is one of the most complete and best preserved archaeological complexes along the Inca Trail to Machupicchu, and is located on the highest point of a mountain. Curiously, Phuyupatamarca means ¨town over the clouds¨. From above, one can observe a sophisticated sacred complex made up of water fountains with solid foundations, and also impressive views of the Urubamba River valley. We set our camp in Phuyupatamarca and spend the night there. Day 4: Phuyupatamarca to Machupicchu: Today, we might have the chance to appreciate one of the most spectacular sunrises in the Inca Trail, provided the sky is clear, as Phuyupatamarca’s location offers awesome views at this moment of the day. We then start our way through the long descending stone steps which will lead us to Wiñaywayna (2650m/8692ft), where we find a campsite equipped with a restaurant, bar and bathrooms with hot showers. The campsite has the same name as the complex located only five minutes away from the lodge. Wiñaywayna is the biggest archaeological site in the Inca Trail besides Machupicchu and consists of an impressive complex made up of an agricultural center with numerous terraces, a religious sector and an urban sector, offering spectacular views over the already narrower Urubamba River valley. After our visit, we leave Wiñaywayna to climb to Intipunku, or The Sun Gate. This will take an hour of hiking along a trail of flat stones on the edges of cliffs in highland jungle. From this fabulous spot, we may enjoy spectacular views over the sacred citadel of Machupicchu, weather permitting. From Intipunku, a short walk brings us down to the entrance from where we continue down to Aguas Caleintes town. Day 5: Machupicchu to Cusco: We wake up early and board a bus, which will take us up to Machupicchu where we begin a complete guided tour of the Inca citadel that will take approximately two hours. We will then have free time to walk around, climb up the Huaynapicchu Mountain, where one can experience spectacular views of all of Machupicchu, the valleys and mountains that surround it, or we can visit the Temple of the Moon or the fabulous Inca Bridge. In the afternoon, we meet in the town of Aguas Calientes where, if you like, you can visit and relax in its hot springs. From here we take the train back to the city of Cusco, where we arrive after nightfall. Train return to Ollantaytambo ” Ollanta” in the afternoon at: 17:00 or 18:00 plus a Sun God Peru private BUS to Cusco return is included in your Package. To Up-grade Vistadome Train at 3.25 pm all the way to Poroy (25 minutes nera Cusco – New Vistadome Train Station ) $36 extra per person. Pre-departure Inca Trail briefing, informative presentation by your guide. Private bus to km 82. Entrance fee to the Inca Trail national park. 2 licensed tour guides for 9 to 16 (max) trekkers. Health Insurance for our porters, cooks, assistants, field crew and SUn God Peru staff. Accommodation, food & transport, permits and entrance fees for our porters and cooks. 11 nutritious, delicious buffet meals with fresh, high quality ingredients, high in energy value and prepared carefully to avoid illness. Combination of International & Peruvian cuisine, 4 breakfasts, 4 lunches, 3 dinners, & drinks. Wake up coca tea each morning in your tent for a gentle start. Boiled purified water after breakfast to refill your water bottles. Happy hour with macho-tea or hot drinks every afternoon. Oxygen assistance and first aid kit. Snacks for tour in Machu Picchu, buffet celebration lunch in Aguas Calientes “Machupicchu town”. Vegetarian food and specialised diets by request. Thick, comfortable sleeping mattress, pillows by request . 3 hrs Machupicchu guided visit and interpretation. ; guided visit and tours in each of the ruins along. Bus from Machu Picchu to Aguas Calientes “Machupicchu town”. is included. 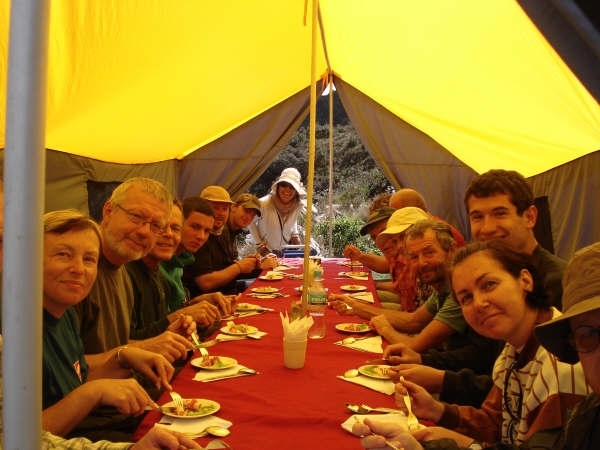 Tips for the trekking crew ; guides, cooks,and porters. $36 Upgrade for Vistadome 1st Class Train 15:20 pm return to Poroy Station arriving 18.50 pm & Shuttle bus connection to Cusco. Unless you hire an “EXTRA” PORTER you need to carry your back pack, sleeping bag and the mattress. You need to indicate this at the time of booking as porters who carry for the full 4 days require permits in advance in the same manner as trekkers. PORTERS to carry up to 9 Kg = $60 up to 18 Kg = $120) for the full duration of the tour from Cusco to Aguas Calientes. Regarding porters who carry personal items. You will need to carry with you a daypack with your Camera, water bottle, snacks, a fleece or something warm and a poncho in case of rain (unlikely in Dry season but as a precaution) and anything you will need before lunch as porters do not walk alongside you. Your bag will be waiting for you in your tent at campsites. Best to put everything up to 18 Kgs in one backpack for the porter so that you don’t have 2 large backpacks in your tent. We can provide you with a big rice sack that is not heavy but also not water proof so use plastic bags around your gear. The porters have large ponchos to cover them and the bag. PLEASE NOTE.- there are fines if you give an excess of 9 Kgs or 18 Kgs so try to underpack rather than overpack or pay for an extra 9 Kgs. TIPPING .- The recommended amount to cover this tradition is approx US $25 -$30. Groups are generally accompanied by 19-22 staff for a maximum 16 trekker group. As for all American countries, tipping is common practice and is a part of the experience but not obligatory. Generally groups prepare a collective tip which is shared out between the trekking crew, porters and cooks on the 3rd night. It is customary to thank the guides with a voluntary tip after the Tour in Machupicchu on the fourth day in Aguas Calientes. For people over 65 / or questioning their ability to trek the altitude the Short 2 Day Inca Trail is recommended. It is possible you will feel the effects of altitude upon arriving in Cusco (3,400 m or 11,350 feet). Remember that arriving from a lower elevation (like Lima) to the Andes, the % of oxygen is less. You will feel tired and weak before adjusting to it. It is best to arrive in Cusco at least two days before setting out on the trail. Don’t drink alcohol, smoke or take sedatives. Drink lots of water and coca tea, have a good night’s sleep, and eat moderate, light meals high in carbohydrates. Very Important! We encourage you to allow for at least 3 days in Cusco before your trek; apart from there being so much to see and do (see the other activities we offer), it is possible that your arrival could be delayed due to transport strikes or cancellation of flights due to poor weather, etc. Altitude affects everyone differently and you may need more time to acclimatize. Because there is no way to change your permit to another date you could miss out on your Inca trail experience altogether. So please keep this in mind when choosing the date of your trek and making your travel plans! Water: We suggest you take a 2 litre bottle of water on the first day and then you can refill this throughout the entire trek. We boil water each night and you can fill your water bottle after breakfast each morning. We suggest you take water purification tablets or filters for water you take directly from streams or waterfalls. You can buy water throughout the first day, for the first few hours of Day 2 and from the afternoon of Day 3 at the Hostal in Wiñaywayna. Temperatures during the day: If you are walking in the sun it is very hot and feels like 26 degrees Celsius, but when you walk through the forest or in the shadow of a mountain it can feel like 14 degrees almost immediately. On the second night, due to the higher elevation, the temperature is cold, ranging from 0 to -5 degrees Celsius! The third night at 2700 m, “high jungle,” is warmer. The best way to deal with the changes in temperatures is to try and keep your body temperature as regular as possible by wearing layers: put on that extra layer before you get cold and take off a layer if you start to feel warm, before you perspire which will leave you with a chill if it gets cold again. The weather from December through to early March is the wettest on the trail. Some days it may be drizzly all day or you may have a burst of rain and clear skies for the rest of the day, or it could be wet off and on all day. You need good rain gear for walking as well as something to protect your pack. We have dining tents so you are protected from the elements during meals. Hot Showers along the Trail: There is a basic timed electric shower at the 3rd night camping in Wiñaywayna for 10 Soles but please do not expect too much!!! Along the trail a little hot water will be offered to you every morning and before meals for a quick wash. Worth taking antibacterial gel but hand washing and drying is imperative whenever possible to avoid transfer of viruses. 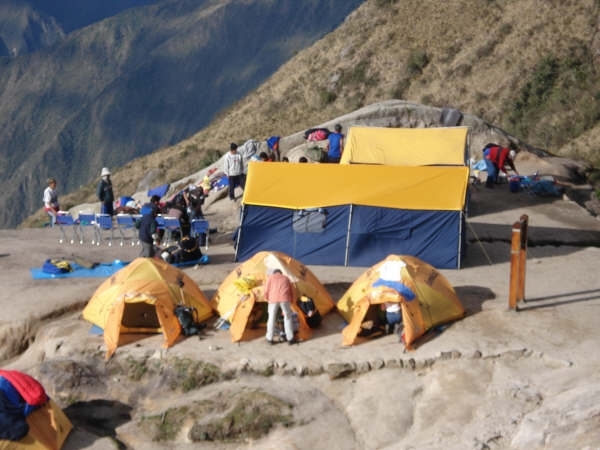 Toilets : In each of the Campsites there are basic toilets constructed and maintained by the Inka Trail Park control. Bring your own toilet paper. Garbage : There are many bins along the trail. At lunch time and at campsites our porters will always clean the area. Please keep this historical sanctuary clean and cooperate so that we leave no trace! Take all trash with you and remind others not to litter! Unexpected : Don’t be surprised to find Gatorade, Coca Cola, Cuzqueña Beer and even Snickers chocolate bars at 4,200 meters along the trail. What happens if I get exhausted or weak in the middle of the trek? : SAS has a low record of hikers that decide to turn back. Our trekking staff will accompany you back if necessary, but they are prepared to walk at your pace, carry your pack and even you if necessary, for you to reach the top. Flexible – we’re experts at creating custom trips, not just forcing you into cookie-cutter options, so you can travel in the style you prefer. Manageable – Porters carry the heavy camping gear, leaving you free to enjoy treks with just a daypack. Discover for yourself the warmth and generosity of the Peruvians who welcome you to their land with grace and enthusiasm. *Please note that Inca Trail hiking permits are limited and issued ‘first come, first served, so you are encouraged to reserve early.